Opposition politician may be stripped of his seat in parliament. 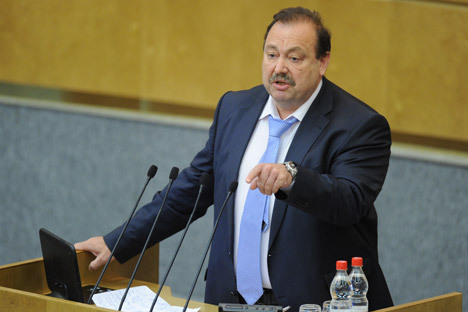 Gennady Gudkov, a four-term State Duma deputy, may soon be stripped of his mandate. The official reason has been cited as illegal entrepreneurial activity. But the politician claims he is being targeted for his uncompromising struggle against the authorities. The State Duma returns from its summer recess to a scandal; it will have to consider stripping Gennady Gudkov, a veteran lawmaker from the Just Russia party, of his parliamentary powers. Gudkov became known as a leader of the opposition earlier this year, when he actively supported anti-government protests. But his actions seem to have come back to haunt him. Numerous inspections of his family's businesses by law enforcement (which the disgraced deputy claims were instigated by the authorities) resulted in a prosecutor's appeal to have the Duma strip Gudkov of his powers as a deputy, on the grounds of illegal entrepreneurial activity. Gudkov, the owner of many private security firms that are members of his Oskord association, is well known in the world of politics. The retired FSB colonel and former KGB officer-turned-businessman was first elected to the State Duma in 2001 and served four consecutive terms. While he chaired the People's Party, Gudkov worked in the parliamentary group of the ruling party, United Russia ‒ something the biography on his official website fails to mention. His search for a suitable party eventually landed Gudkov in the ranks of the Just Russia parliamentary group. Gudkov became an active opposition figure following the parliamentary elections of December 2011; he has not missed a single major opposition rally in Moscow since. He fought for opposition rights not only in the capital but also in the provinces, travelling, for example, to Astrakhan to support Oleg Shein, a fellow Just Russia member who went on a hunger strike after losing the race for the Astrakhan mayor's office. Gudkov's oppositional activities have not gone unnoticed by the Kremlin. At least that's what the politician himself has been claiming, ascribing his tribulations to the powers that be. This summer, law enforcement agencies turned their attention to the Gudkov family's Oskord association. A probe was launched based on an anonymous tip-off alleging violations within the company: neither the State Duma nor Gudkov's own staff have seen a copy of that document. Later, a complaint against the politician was filed from abroad by Ivailo Zartov, a Bulgarian citizen and Gudkov's former business associate, who claimed that Gudkov owned a business in Bulgaria Investigators were quick to confirm this report and considered it appropriate to initiate criminal proceedings against the Just Russia party member. However, criminal proceedings cannot be initiated against a serving member of parliament unless the chamber strips him of immunity. The State Duma did just that at the end of its spring session, when it partially withdrew immunity from Communist party member Vladimir Bessonov, albeit for a different reason that involved the alleged beating of a policeman. Before that, Ashot Yegiazaryan, a Liberal Democrat deputy suspected of fraud, also lost his immunity. In Gudkov's case, the Prosecutor General's Office and the Investigative Committee went directly to State Duma speaker Sergei Naryshkin, asking him to revoke the deputy's powers with immediate effect. Members of the pro-government United Russia group in the lower chamber publicly denounced Gudkov , without waiting for any official decisions. The matter of relieving Gudkov of his powers will be taken to a plenary meeting on Sept. 12. Before that, the Duma's commission on deputies' income control had to decide on the “Gudkov case”. Predictably, the commission has agreed to check the evidence supplied by the prosecutors. Gudkov himself insisted on this, saying that he was ready to cooperate fully with the investigation. However, he made a point of reminding his colleagues that all the evidence gathered against him dates back to before 2009, i.e. to the previous Duma term. Moreover, there a conflict of laws exists. On the one hand, deputies are prohibited from serving on corporate management bodies, but on the other hand, any shareholder is incorporated into them by default. There is no ban on deputies holding shares or equity stakes; the only requirement is that they must place them into a trust, which is exactly what Gudkov did in 2009. Remarkably, Gennady Gudkov is not the only shareholder among the Duma members who might be suspected of illegal entrepreneurial activity. His son, Dmitry Gudkov, also a Duma deputy, has defended his father's interests by launching an entire project aimed at identifying entrepreneurs among United Russia deputies. The younger Gudkov says that the lower chamber is home to 93 United Russia deputies who are shareholders, most of whom could be also suspected of being business people. The young politician has been posting his findings online and feeding them to the press. In response, United Russia's leadership has accused the pair of running a “family business”, but is in no hurry to verify the published evidence. If Gennady Gudkov loses his mandate on Sept. 12, it will be the second such case in the history of the lower chamber of Russian parliament. Sergei Mavrodi, the mastermind behind the MMM Ponzi scheme, said farewell to his Duma seat in 1995. That said, Gudkov's supporters insist that Mavrodi ran for parliament in an attempt to hide from the law in the first place. His seat was taken away in a manner that was in violation of regulatory procedure, and the reason for taking away his seat - fraud - was much more serious. Mavrodi was only brought to justice in 2003, after spending many years on the run. Gudkov has made it clear that he will not go into hiding. “No one is safe from poverty or prison,” the politician quipped to journalists after a meeting of the income control commission.